Once upon a time……. There lived a Green Ogre with an annoying Donkey and his lady love! This love story of an Ogre with a princess was loved by all of us. “Shrek – Forever” is one of the popular movies. Shrek, American Animated movie is one of the great ideas for Halloween Costumes both for adults & kids. Shrek & Fiona with their annoying Donkey make a great costume Idea for Halloween. PartyBell.com has various styles Shrek Halloween costumes for Kids. Transform your little one into this Fun-loving Ogre in this Shrek Forever After Deluxe Costume. This Costume includes jumpsuit with attached headpiece. This is an officially licensed Shrek costume. 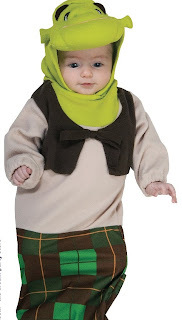 For your newborn little one, go for this Bunting Shrek Costume this Halloween. Bunting Costume will keep the little Ogre warm and comfortable. Little Ogre will be the apple of everyone’s eye this Halloween. This Costume includes one bunting and headpiece. This is an officially licensed Shrek costume. Cursed princess who spent her entire life locked in a dragon-guarded castle, waiting for a handsome prince to come rescue – that is Princess Fiona. Let your little girl the feel of Princess in this Shrek Forever After Fiona Warrior Costume. From a soft-hearted Princess to a Warrior to save her land, she is strength symbol to little girls. This Costume includes dress, belt, cuffs, and headpiece. Does not include boots. This is an officially licensed Shrek costume. True style “Princess Fiona” Costume for those little girls this Halloween. This Costume includes dress and headpiece. Does not include shoes. This is an officially licensed Shrek costume.